Priya Prakash Varrier raises the temperature in the latest pic. Malayalam actor Priya Prakash Varrier has become a national crush. The wink girl became the national crush after her song Manikya Malaraya Poovi from her debut film Oru Adaar Love went viral. Lately, she took to Instagram to share a few pictures in a purple colour dress where she sensuously poses for the camera. She never misses to impress fashion police with her sartorial choices and carries each outfit with utmost grace and elegance. Her hair and makeup are up to the mark and make her sexier in the photoshoot. Priya Prakash Varrier has become the most searched personality of the year leaving behind Sunny Leone. She keeps teasing her fans with her hot and sensuous pictures that prove that she has now also become a glamorous diva. Giving a sensuous look for the photo, Priya is grabbing the eyes. Priya captioned the pic as, “For @ritzmagazine MUH: @samson_lei Styling: @styledbysmiji Outfit: @jazaash_ Pc: @shafishakkeer Location: @novotelkochiinfopark”. Currently, Priya is gearing up for her Bollywood debut film Sridevi Bungalow. However, the film is in a soup of controversies with Boney Kapoor slamming the legal notice in the makers and the actress. 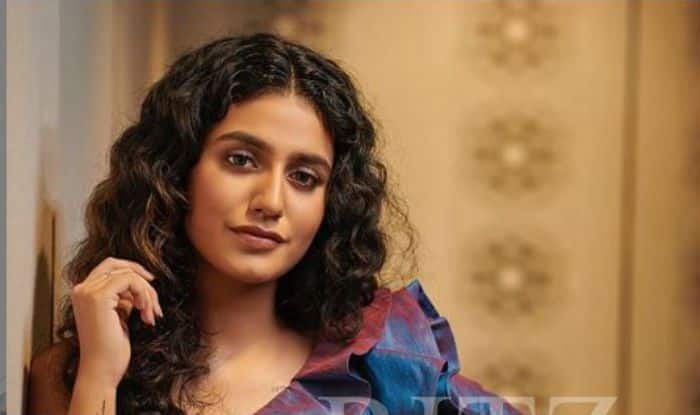 Priya became an internet sensation after a clip from one of the songs of Oru Adaar Love went viral on the social media. In it, she was seen winking and exchanging flirtatious glances with her co-star. Along with Priya, the film also features Siyadh Shajahan, Roshan Abdul Rahoof, and Noorin Shereef in crucial roles.